Just when you thought things couldn't get any better for BMW's M2 Competition, they surprise us with an abundance of new carbon-fibre parts. 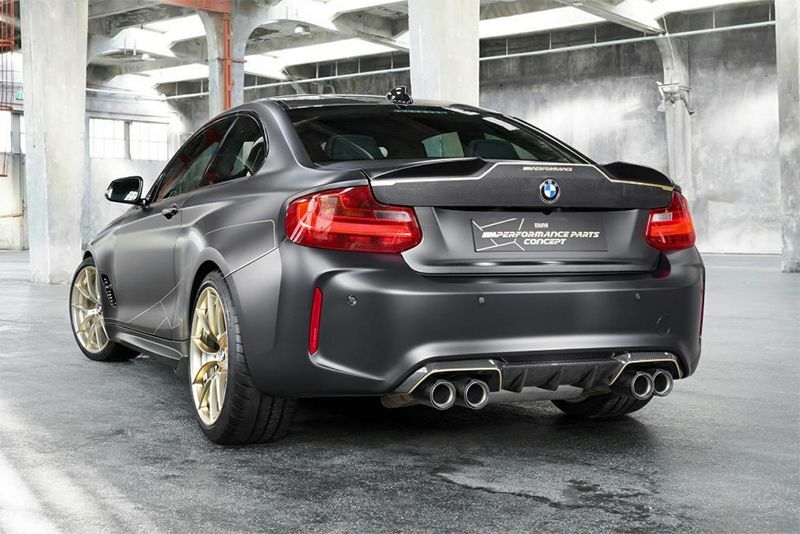 That's right, at the Goodwood Festival of Speed recently, BMW showcased their upcoming range of new performance parts, all bolted onto a modified M2 coupe they're calling the BMW M Performance Parts Concept. You may be thinking, 'but this isn't news, BMW already offers a range of M Performance Parts', and you aren't wrong. But the new add-ons are next-level. Not only do they, according to BMW save 60kg, but they offer tangible aerodynamic improvements too. As you drool over the images above, you'll see the concept is coated in a custom metallic Frozen Black with gold accentuations. This was intentional to make the extensive use of carbon fibre stand out. It includes the front radiator grille that'll be available later this month and a new bonnet that saves 8kg shortly thereafter. In November you'll be able to tick the boxes for carbon fibre front wings, and early next year a carbon fibre tailgate that saves five kilograms and full carbon roof seal the bodywork deal. In the aero department, the new tailgate sports a revised lip spoiler while an M Performance carbon fibre rear diffuser finishes off the rear. There are also two sets of winglets, one pair at the front of the car and another at on the side skirts near the rear wheel. Hop inside the M Performance Concept and you're greeted with new Alcantara-clad carbon fibre sports seats up front and new lightweight seats in the rear, saving 13 kilos between them, while the driver sits behind a new M Performance Pro steering wheel. The M Performance Concept sits 20mm lower on its performance coilover suspension, and the – six kg's lighter – 19-inch forged wheels round off this altogether rather stunning package.